Last year, according to The Street Vendor Project, an advocacy group with the Urban Justice Center, the building managers, Hines Property Management, installed a bike rack on the Cedar Street side to make it difficult for a vendor to legally place his cart on the sidewalk. In 2013, the Street Vendors Project fought and lost against a Citi Bike station on the Liberty Street side of the plaza that they said had been requested by the building’s management in order to displace vendors. The CB1 committee recommended that the Landmarks Commission, who will hear the presentation on Feb. 6, approve the plan. But it rejected the lighted stanchions that are meant to indicate the building’s property line on the Cedar Street side. 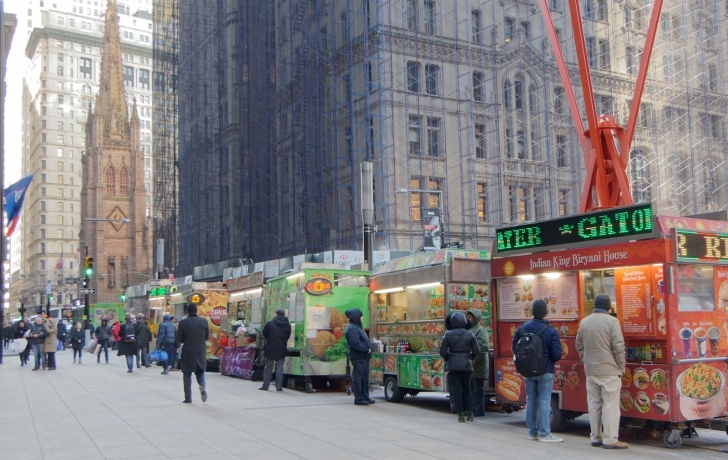 “We shouldn’t be messing with landmarks to keep the food vendors out,” committee chair Roger Byrom said. The full board will vote on the resolution at its meeting Tuesday evening, Jan. 23. Submitted by admin on Mon, 01/29/2018 - 6:03pm. Vendors' threatened eviction is "depressing and enfuriating"
Submitted by admin on Wed, 01/24/2018 - 12:41am. Apparently the building owners and their complicit landscape architect wish to transform Downtown New York into an upscale suburban mall. It's depressing and infuriatiating to read that the food cart vendors in our commercial downtown are being threatening with eviction. We need these affordable alternatives to expensive and time-consuming restaurants and cafés. People who have to work late or on night shift certainly need quick and cheap options to keep them going. It's also reassuring if you are walking home or to work at night to have food cart vendors in the vicinity in this otherwise deserted neighborhood. This is a city where the huge variety of foods and prices and ways of getting fed needs to be fostered, not zoned out of upscale neighborhoods.